More than 2,000 pristine fossils have been found and half are animals completely new to science. A newly discovered fossil site in China is a treasure trove for paleontologists studying the Cambrian explosion, when life on Earth suddenly and massively expanded in diversity about 550 million years ago. More than 2,000 specimens were found at the 518 million-year-old site and more than half the species they represent are animals that scientists had never seen before. "The Qingjiang biota is really one of the most exciting fossil discoveries in the last few decades," Allison Daley, a Canadian paleontologist at the University of Lausanne in Switzerland told Bob McDonald of Quirks & Quarks. She reviewed the research paper that announced the discovery, and says the site is hugely important because of the abundance and diversity of fossils that preserve exquisite details of these early animals. 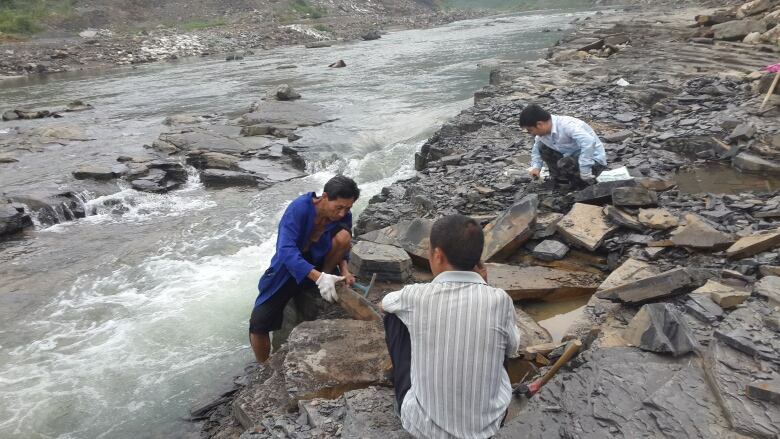 The fossils were found in a river bed near the junction of the Danshui River with Qingjiang River in Hubei, China. Water flowing through the river bed cut down on the bedrock and exposed layers of rock that scientists were able to excavate. "When the water level is really low, the scientists can get in and crack open the rocks to reveal the fossils," said Daley. "But it's a tricky place to work." The thousands of fossils collected so far are in pristine condition, unaltered over the last half-billion years. One of the most exciting aspects of the find were the soft tissues and soft-bodied organisms that were preserved. These kinds of tissues typically do not make it into the fossil record. Researchers found not just bones and shells, but skin, organs, and even impressions of the animals' brains. "You can see the eyes, internal organs, the gut and sometimes even their last meal," said Daley. "The fossils are absolutely stunning in terms of abundance and the amount of detail." The organisms likely lived and died in a shallow marine environment before they were transported into the deeper ocean environment where there were fewer animals and microbes to decompose them. "The cold, dark, hypoxic environment means there was no chance for the soft tissues to decay," explained Daley. "They were rapidly buried in sand and sealed from outside factors." The Cambrian explosion was a period when life on Earth evolved from from small and simple, mostly single-celled organisms, to big and complicated animals. Many of the fossils found during that period showed a wide diversity of strange looking animals — sometimes called the "weird wonders" of the Cambrian. It may be the most important evolutionary transition in the history of life on Earth, and scientists are still trying to work out what caused it. A wide range of animals was found at Qingjiang site including the simplest sponges, jellyfish, sea anemones, worms, primitive fish and different kinds of arthropods. More than half of the animal species were also completely new to science. Researchers were baffled by their strange forms and have struggled to classify them. One of the more outrageous organisms had a body that's shaped like a bag with an internal gut and tentacles protruding from its mouth. Scientists are currently studying these new specimens to try and place them in the tree of life. Daley believes this new site is hugely important in furthering our knowledge about the Cambrian period. "Future work will help us better understand how these animals interacted with each other, how they diverged, what the Cambrian environment was like, and maybe even the causes of the Cambrian explosion."